Gigabyte emailed HEXUS today to tell us about its recently launched G190-H44 barebone server. The Taiwanese PC and components specialist is proud to announce that the G190-H44 as its first high performance computing 1U server supporting 4 x double slot GPU / computing cards. The new Gigabyte G190-H44 is an official partner product supporting the recently unveiled Nvidia Tesla M60 cards, and an Nvidia GRID certified server solution. 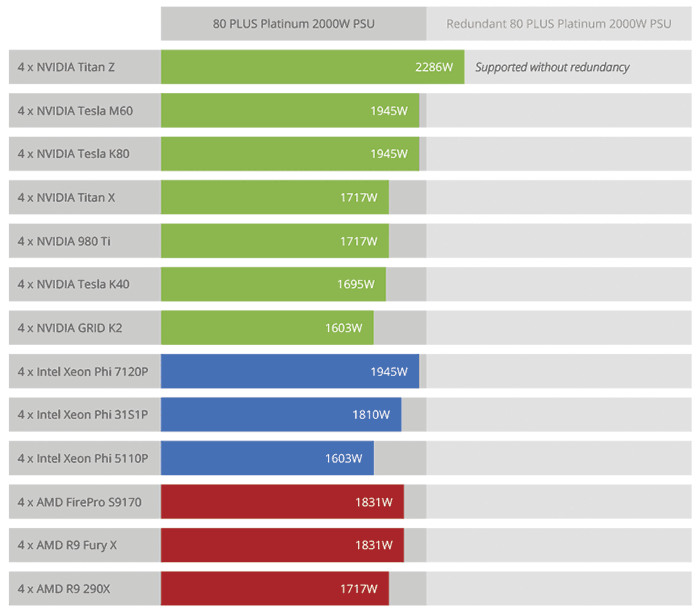 However it isn't restricted to using the latest Nvidia GPU computing card, nor to Nvidia branded cards, a full range of Nvidia, AMD and Intel Xeon Phi cards are supported by this server. Looking at the rest of the important hardware specifications, Gigabyte's G190-H44 1U barebone system can be fitted with up to 2x Intel Xeon E5-2600 V3 processors, uses the Intel C612 chipset and supports 16 x DDR4 DIMM slots. For storage there are 2 x 2.5" hot-swappable HDD/SSD bays, 2 x 1.8" fixed HDD/SSD bays and 4 x SATA III 6Gb/s ports. Intel SATA RAID 0/1/5/10 is supported. Networking hardware includes 2 x GbE LAN ports (Intel I350-AM2) and 1 x 10/100/1000 management LAN. On board video comes from an integrated Aspeed AST2400 2D Video Graphic Adapter with PCIe bus interface providing a maximum of 1920 x 1200 @60Hz 32bpp. Two 2000W redundant 80 PLUS Platinum PSUs are included in this barebones system. Of course this barebones has 4x full length, full height expansion slots – where you will fit the headlined (up to) 4x GPU accelerator cards. There are also 2x full length low profile slots and you can order raiser cards depending upon what expansions you require. 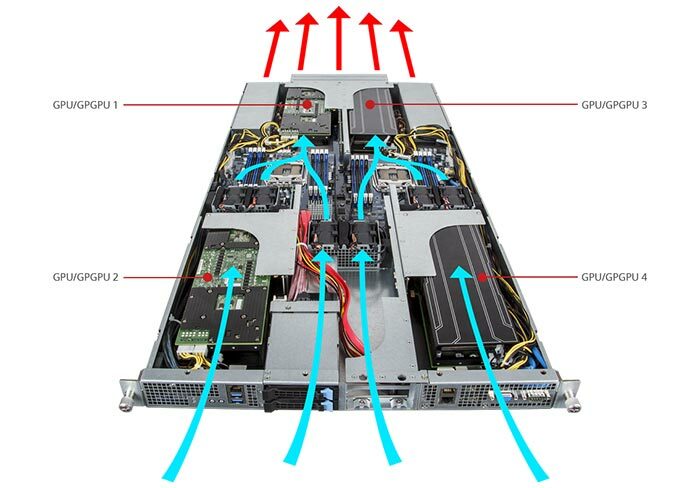 Gigabyte says its G190-H44 1U server offers an optimised airflow to keep all these cards cool in a rackmount configuration. For durability and reliability Gigabyte use industry-leading IR Digital PWM and IR PowIRstage IC controllers for CPU and memory power delivery and OS-CON capacitors. A plethora of internal and external I/O is provided. Gigabyte facilitates many system management functions (inc Remote System Management) and supports Windows Server 2008 R2 (x64), Windows Server 2012 (x64), Windows Server 2012 R2 (x64) plus various Linux distributions and VMWare versions. Earlier this year we saw Gigabyte pioneer GPU intensive server products in the UK, with the launch of the G250-G52 high performance computing (HPC) 2U server chassis with support for 8x double slot GPU / computing cards.